Music artists, producers and lawmakers applauded the passage of the Music Modernization Act at an event honoring Tony and Emmy award-winning singer and actress Kristin Chenoweth and gospel legend Yolanda Adams. Chenoweth was honored for her work at her theater in her hometown of Broken Arrow, Oklahoma and Adams honored for her artist advocacy work over the course of her career. "Tonight, they're recognizing the work that I've been doing, it's very much appreciated," Chenoweth told ABC News at Grammys on the Hill, the annual Recording Academy advocacy kick-off event. The arts have "so much power," she said. "When I was growing up, if I hadn't had music and dance, I don't know what I would've done and as you know we're losing that across our country and I would certainly like to help reverse it," Chenoweth continued. 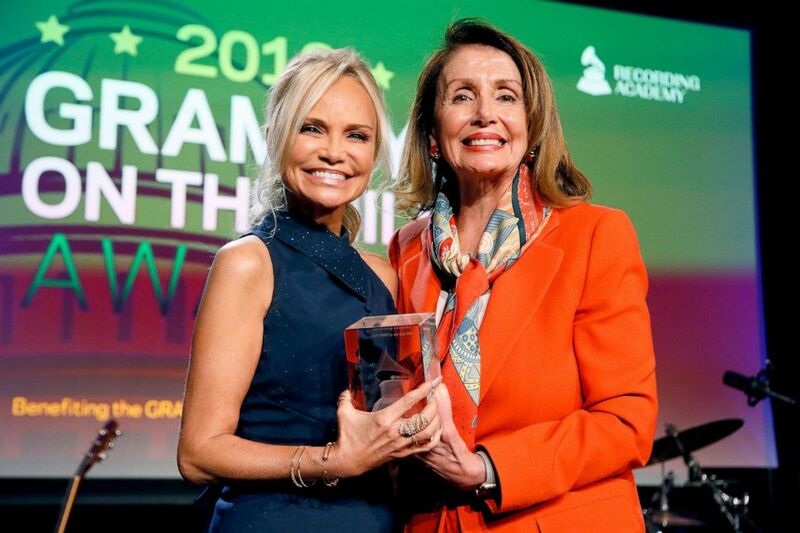 Kristin Chenoweth and Nancy Pelosi pose on stage at GRAMMYs on the Hill 2019 on April 9, 2019 in Washington, D.C. In presenting Chenoweth the award, House Speaker Nancy Pelosi, D-Calif., said: "Kristin knows that music and the arts have a unique ability to inspire us." For Adams, getting this honor from the Recording Academy meant so much - in part because she has honored others at the same event. "When you are doing the work, you really don't think about you know how it is going to affect other people down the road or at that moment, you just know you're singing from your heart, you're writing from you're heart, producing from you're heart and also advocating from you're heart," Adams told ABC News. "So for me, that was the reward already, so when they called and said hey we want to honor you, I'm like for what!" she continued. 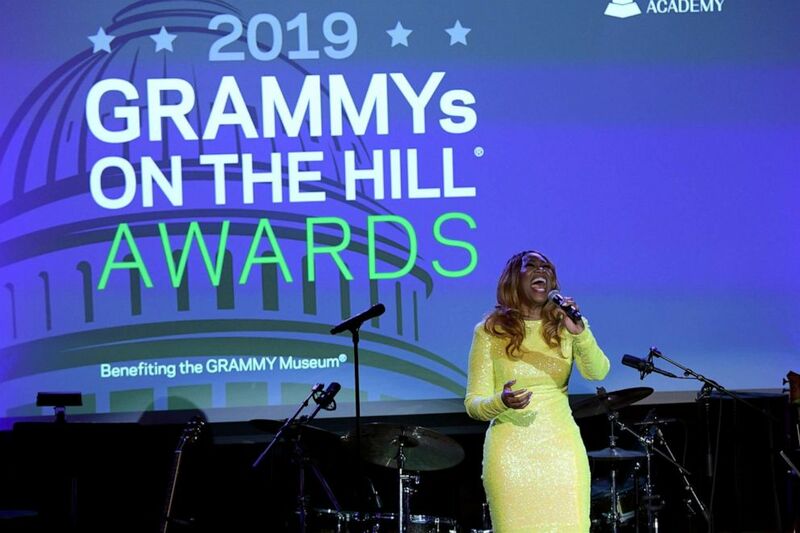 PHOTO:Yolanda Adams performs onstage during GRAMMYs on the Hill 2019, April 9, 2019, in Washington, D.C. The event also featured performances from Chenoweth and Adams. Chenoweth took the stage with a local high school student to sing a duet - having never rehearsed and just meeting the day of the event. Rep. Hakeem Jeffries, D-N.Y., and Sen. Chuck Grassley, R-Iowa, were also honored for their music advocacy work. "Music is a universal language," Jefferies said while receiving his award. Afterward, the other members of Congress in attendance took the stage to join Linda Perry of the 4 Non-Blondes to sing their hit "What's up." The event was a victory lap for those who also fought hard to pass the Music Modernization Act. The legislation signed last October, updated music copyright law, combines the Allocation for Music Producers Act, which provides royalties for music producers; the CLASSICS Act, which provides royalties for songs created before 1972 from digital streaming services; and a revised Fair Play Act, which does not include the provision that broadcast radio should pay for songs. "I am one of those artists that got a check when the Modernization act passed," GRAMMY-nominated R&B singer Kenny Lattimore said. "This is essential actually, this is how we make our living," Lattimore continued. Jerry Harrison of the rock band, the Talking Heads told ABC News the legislation makes it "fairer" for musicians who are struggling to get paid for their work on streaming services. "We'll have more artists scraping by but they are artists and not having to say 'oh this just doesn't work," Harrison said. This year, the recording academy hopes to get legislation passed that addresses the so-called FM/AM loophole. Radio stations do not pay for royalties to play songs over the air – a practice that needs to change according to Recording Academy President Neil Portnow. "Next is radio, and paying fair royalties to performers. We're the only civilized country that doesn't do that - puts us in the company with China and North Korea, so it's time for terrestrial radio to join the rest of the spectrum's and pay artists and songwriters fairly," outgoing President Portnow told ABC News. Adams agreed, that the next legislative priority is AM and FM radio. "We're going to keep on fighting so we can make sure terrestrial radio gives us, you know what we rightfully earned and make sure the next generations of artists don't feel that they have to play their music underground," Adams said.